Mandy Foot Children's Book Reviews & A Giveaway!! I was delighted to recently receive two of Mandy's books to review. 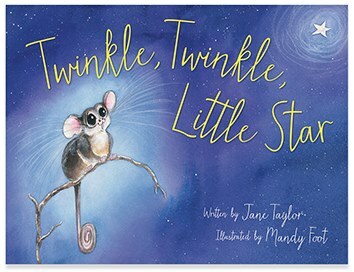 Twinkle, Twinkle, Little Star is written by Jane Taylor, and illustrated by Mandy. It was released earlier this year. The story features an adorable baby pygmy possum travelling through the night in the Australian outback. The illustrations are wonderful; featured animals include an echidna, wombat, and a dingo. Each character is brought to life on every page. Told in rhyming verse, this would make for an enchanting bedtime story to read with your little one. 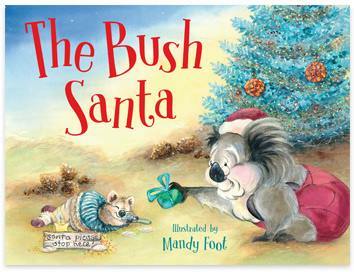 The Bush Santa is Mandy's latest release, and it centres around a very sweet koala Santa making trips all around Australia to deliver gifts in time for Christmas. I love that this story teaches children about Australian animals and places whilst engaging them in a story of Christmas festivities. Some of the places that the koala Santa visits include Tasmania, Cairns, and Byron Bay. I spent time explaining to my youngest daughter where these places are located in Australia, as she had only heard of some of the places. It was a great opportunity to discuss this with her whilst I had her attention. Once again, the illustrations captivate an audience of both young and old, with their bright hues and impressive attention to detail. This book would be perfect as a stocking-stuffer this Christmas! And the best part of all is that you can win your very own hardback copy of The Bush Santa!! What is your favourite Australian animal, and why? 2. Giveaway closes on 17th November, 6 pm; winner/s will be contacted via email within 48 hours. Failure to receive a response from the winner/s will mean the prize is forfeited and a new winner/s will be chosen. Disclosure: I was given 2 books from Mandy Foot's range to review, with an extra copy offered as a giveaway. I was not paid for this review. All opinions are my own and are not influenced in any way. 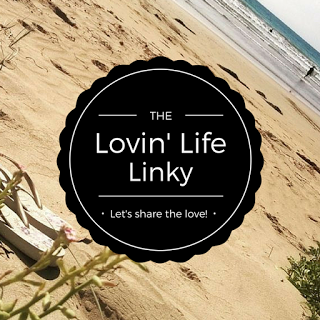 PS Thanks so much for linking up and displaying my badge on your site! We love Koalas!! Living in the country for lots of years we see them often. My 3yr old loves that they sit so high in the trees and are able to see for miles while munching on the gum leaves. We have Twinkle, twinkle little star and it's my sons favourite book for me to read to him and he loooooves the pics... would be awesome to add to the collection. We love the Koala!! Living near the countryside we see them often. My 3rd old loves that they sit so high in the trees where they can see for miles while munching on gum leaves. We have Twinkle, Twinkle little star and it's my sons favourite book that he picks for me to read at night to him. He loves the pics!!! Our favourite Australian animal is the platypus because of his unusual appearance as well as its ability to lay eggs. Although they are really hard to see in the wild.....they are the first animal we head for at the zoo. My favourite Australian animal is the wombat! I love they way they walk and they are so cute and cuddly looking. My favourite Australian animal is the wombat!! They are so cute and cudylooking and I love their walk. Also my nickname when I was s child was wombat. Loved wombats ever since. I'm going to say the blobfish, I feel for him. I'd love to cuddle one some day. Sugar Gliders! They're very cute, and the way they glide through the air is amazing to see! Has to be the koala: they epitomise Australia and for sentimental reasons, my Mum had a photo of her holding one on the fridge at home in the UK, sadly she passed after I'd emigrated to Australia. Knowing how much she loved the photo the day after we lost her I visited the lovely Lone Pine Koala sanctuary and "adopted" a koala in her name. As an animal lover I know she's have been happy with that. The gorgeous little bilby, so little and cute. I love their big ears. Sounds lovely and pics are adorable. I love the Kangaroo, he's so different form any other animal, he bounces around all day, eating grass and mating! The Quokka, funny name, gorgeous animal, uniquely Australian, and is always smiling. They're a rare gem that we need to treasure! We love to see him around and about!